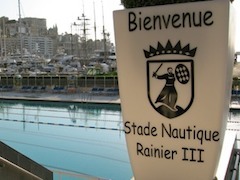 The Stade Nautique Rainier III opens on Saturday 30 Apr at 9:00 for swimming and sun-bathing in Monaco's Port Hercule. Entry for the day is 5.60 euros, with a morning tariff of 3.20 euros and an evening ticket priced at 2.30 euros. Discounts are available for books of 10 and 20 tickets, reduced prices for under 12s and seniors aged 60-64, and free of charge for under 3s and over 65s who are residents or Monegasques. Qualified lifesavers watch over the Olympic-sized, heated seawater pool, which is fitted with four diving boards and two water slides. There are aqua keep fit classes on Tuesday mornings from 9:30 to 10:00, and for those who just want to relax there are pool side loungers with parasols for rent and a selection of magazines and books for loan. Swimmers must leave the pool 20 minutes before closing time. Managed by Monaco Mairie's Service des Sports et des Associations, the outdoor pool is open until 9 Oct. For more information phone +377 93 30 64 83 and visit the website at: Mairie de Monaco: Stade Nautique Rainier III.